Our trip to Nairobi for the Canadian visa had some more surprises in store for us. Last Wednesday my hubby and I got up early and reached the airport at 6 a.m. At the check in counter we were told that we would be put on an earlier flight instead of the 7.40 one and we both thought, finally lady luck is smiling on us. Little did we know what was in store till we reached the departure lounge and saw on one of the TV screens, that a raging fire had completely destroyed the international arrival terminal at the Jomo Kenyatta International Airport, Nairobi. After a while we hear roaring sound of one of the KQ flights landing at the Mombasa Airport. After a few minutes another, then another. This continued till 5 international flights diverted from Nairobi landed in Mombasa. Suddenly our normally not so busy, laid back airport became busy. Then we hear an announcement that all flights to Nairobi have been cancelled till further notice and all passengers have to surrender their boarding pass. Lady Luck was not with us at all. We quickly collected our baggage and rushed off to town to one of the coach offices. With Eid and now no flights, seats on the coaches leaving for Nairobi suddenly were selling like hot cakes. We managed to get 2 seats on a luxury AC coach. When we got on the coach, from which angle it appeared to be a luxury coach beats me. The AC was not working and the uncomfortable journey ended after nearly 9 hours. But we finally reached Nairobi and got our work done and caught a flight back home. Now we have to wait and see if we get the visas. 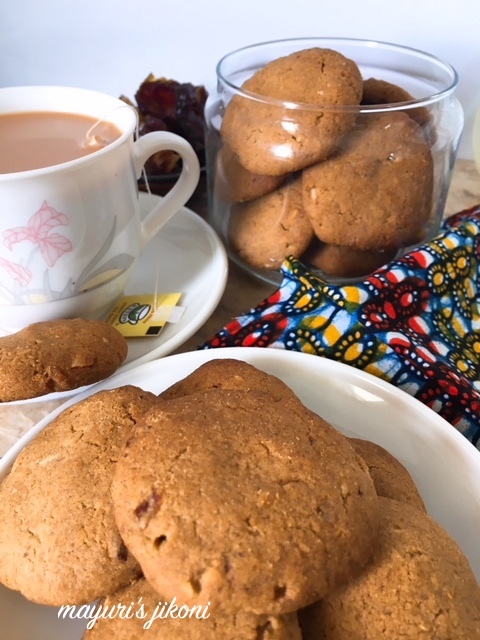 In the meantime, I would like to share with you a recipe for one of my favourite cookies, date and nut cookies. Flavoured with date and crunchy because of the mixture of flours, these cookies are tasty. Since I wrote this post, we got what is called the Super Visa, which means a visa for 10 years which is specifically given to parents and grandparents of people with permanent residency in Canada. Because of our son we got this visa. Since then, we’ve been to Canada four times and this is our fifth visit. As I update this blog, I’m sitting at my son’s home in Montreal. Canada is such a beautiful country. Preheat the oven to 180°C. Lightly grease the baking trays with some butter or use a silicon mat. Put the milk and dates in a heavy based saucepan. Heat the mixture over low heat and stir constantly till a paste is formed. Let the date paste cool down. Sift the flours, soda bicarbonate and salt together. In a big bowl cream butter and sugar together till it is soft and fluffy. Add the date paste, orange juice and orange rind or vanilla extract. Take about a tablespoonful of the dough and roll it into a ball. Press it slightly between the palms or place it on the baking tray and flatten it using a fork. Repeat steps 11-12 with the remaining dough. Make sure you leave about an inch space between the flattened dough when you place it on the tray. Bake for 12-15 minutes or until the cookies begin to brown at the edges. Remove the tray from the oven and let the cookies cool on the tray for 5 minutes. Remove the cookies from the tray and let them cool down completely on a wire rack. If you are using medjool dates you may require less milk. If the dates are a little dry you may need more milk. Can add dried fruits like raisins, cranberries etc. That was quite the adventure you had 5 years ago. Glad it all worked out. The cookies look delicious. Those cookies look yum! and yes that’s some adventure you had..nice to know you got a super visa now and that solved the headache, enjoy your stay with your sons family! Nice to know that you got the visa.BTW cookies look yummy. Never tried dates in cookies… looks so yum. Try them, they taste delicious. This looks so healthy and yum and that too without eggs, must try. I am sure life in Kenya is an adventure itself. I love reading your posts which show us a glimpse of your life there. Those cookies look awesome. What a great adventure you had few years back. I happen to face such situations often nowadays and after reading yours, I can atleast think that I am not alone. The cookies look so good. Looking at the ingredients list, I am sure that they taste wonderful too..
Canada is in my most favourite place to visit. Lucky you are Mayuri. Enjoy your stay. scrumptious cookies, who can resist to this ultimate cookies. Thanks Priya, I just love Canada its such a beautiful country and France too is beautiful. Mireille, I love nuts so add them to anything and everything but you could add other dried fruits or just not add anything else. thanks Ritu, date cookies are very tasty. Wecome to Canada and hope you are enjoying the beautiful weather there. That was quite an adventure that you had few years back for visa. Coming to the cookies, great recipe with lovely date flavor. Thanks Sandhya, we’re going through a heatwave and have to spend a lot of time indoors. Date and nuts cookies looks so crispy and tasty too. Can I skip the sugar and use dates only?? Would it effect the taste or shall I use more dates? I think Sapana you can add more dates. I haven’t tried using only dates but you try out a small batch and let me know how it turns out. Of course then you’ll need less liquid.